I loved Rick Miller’s Boom , which played at the Grand Theatre last year. He cleverly wove together a history of culture, politics and news for baby boomers, playing all roles and using amazing projections. So I was looking forward to his Twenty Thousand Leagues Under the Sea coming to the Grand. Unfortunately, it is disappointing by comparison. 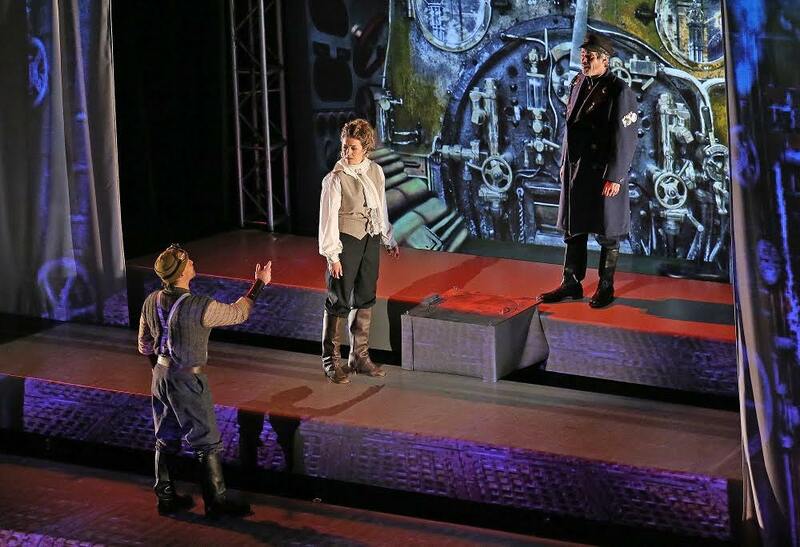 Following the classic Jules Verne novel, this play tells the story of the ship that goes out to find the horrible sea creature that others have reported. On the ship are the narrator Jules (Andrew Shaver), Professor Aronnax (Marie-Eve Perron) and Ned Land (Eric Leblanc). They find that the creature is actually a sci-fi submarine, the Nautilus, under the command of Captain Nemo (Richard Clarkin), who alternatively locks them up or wins them over. Ned Land (Éric Leblanc), Professor Aronnax (Marie-Ève Perron) and Captain Nemo (Richard Clarkin). I know this is a classic tale, published in 1870 by the visionary Frenchman, Jules Verne, and we should all appreciate it. But frankly, the book is a tough slog, and the story seems slow-going and disjointed on stage, too, despite Miller and Francis’ attempt to modernize it. The modernization comes in the form of updating Jules to present day. He is a Ph.D. student working on his dissertation (for seven years, which produced a chuckle from the audience). But rather than write, he plays with action figures, which are then used several times to tell the story in projections. His professor reverts to Claire Aronnax, a female, which is another modern take on the old story. They are concerned with the amount of plastic pollution in our oceans, when suddenly we are taken back to 1868 to hunt down the Nautilus. The creative use of projections saves this play for someone who enjoys such devices. Water appears to pour across the stage, strange sea creatures come out of nowhere, and the submarine surfaces realistically, thanks to high quality projections. In one interesting scene, the four sit at the dinner table and suddenly we have a view looking down at the tops of their heads, as if we were sitting in the hatch of the submarine. Unfortunately, Captain Nemo’s lack of stability causes the characters to turn on each other, which prevents the audience from connecting with any of them. The actors aren’t able to develop relationships and the audience loses interest. The characterization should add to the suspense, but instead seems to create confusion. The actors are difficult to understand. The noisy sound effects of the submarine and ocean waves, plus their accents, make it problematic. At one point, they put on deep sea diving suits including the big round head coverings, and it is impossible to make out what they are saying. The steam punk styling is intriguing, but not consistent. Isn’t the whole story from the steam punk era? And while the action figures are fun at first, they get tiresome in the second act, as does the cell phone videotaping, thus making the attempt at modernization weak. One redeeming feature in this play is the reminder about ocean ecology, ecosystems and marine life. We need to act on eliminating the great plastic blob floating in our seas. It’s scarier than any sea creature or sci-fi submarine.